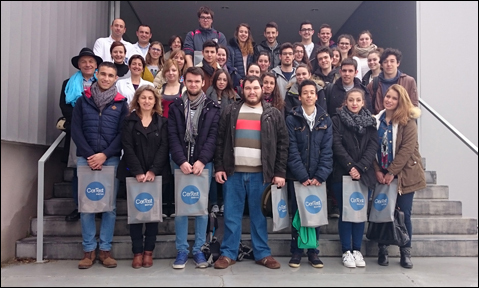 On April 5th, 31 students from the “Lycee Etienne restat of Sainte Livrade” CerTest visited the CerTest Biotec facilities located in San Mateo de Gallego, Saragossa. Guided by the technical staff of the company, the students toured the different rooms and laboratories, seeing how different product ranges of CerTest are manfactured before being exported to over 120 countries in all over the world. As students of “Analysis Laboratory and Quality Control“, they showed particular attention to the explanations on safety and quality that CerTest applies in production and development processes to ensure reliability and quality in its production.